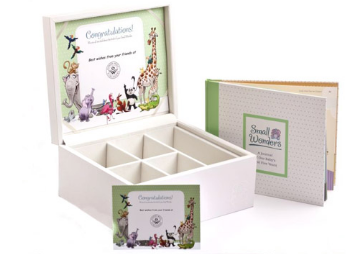 As part of a company congratulatory program, the Small Wonders volume can be presented to recipients inside a beautifully detailed keepsake chest., complete with memorabilia compartment, a personalizes lid insert, and a congratulations card. Show your employees that you care! Few events in life are as powerful and positive as the birth of a child—or rightfully deserve heartfelt congratulations. The Small Wonders baby journal is a unique congratulatory gift that companies can give to their employees to show that they really care. Presenting Small Wonders to employees can foster a genuine sense of gratitude and belonging within the company. 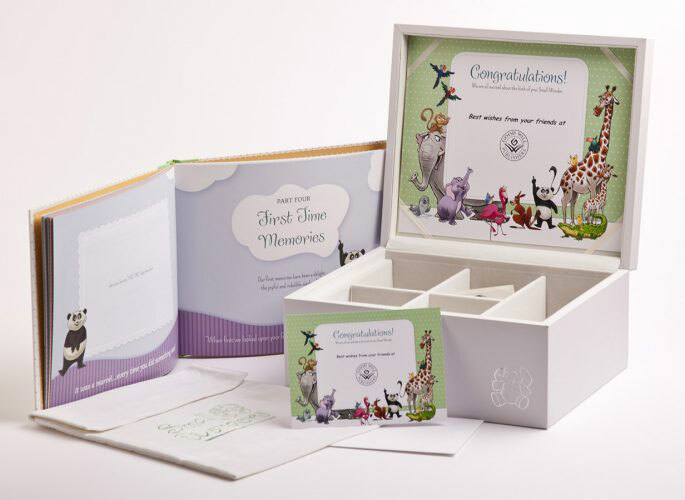 This baby journal is designed to accompany expectant parents from pregnancy through their child’s fifth year of life. 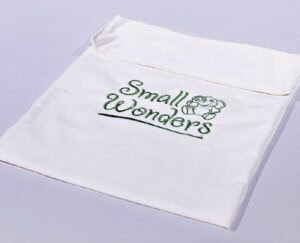 In this way Small Wonders is a gift that keeps giving—becoming a treasured family keepsake and a valued gift from a company that really cares. 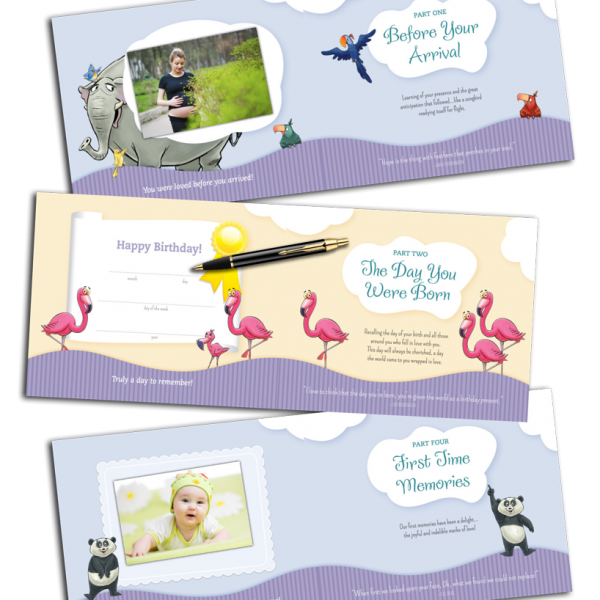 Help employees record their child’s wonderful journey. Small Wonders offers parents a place to record their first impressions of pregnancy, how they shared the news, details of the baby shower, their thoughts on choosing a name, their growing family tree and much more. An entire section is dedicated to the day their child is born —with room to record thoughts on labor and delivery, vital stats, first impressions, baby’s first picture, those in attendance, and those who visited and helped out on that very special day. Rapid changes in an infant’s develop-ment begin immediately and every memory counts. Small Wonders helps parents to re-cord all their child’s precious “first times” in words and pictures. As infants become toddlers their behav-ior really blossoms. Their activity increases, they learn to roll-over, sit-up, crawl, walk and explore their surroundings. As they grow their expressions and reactions produce countless funny faces, sounds, and moments that fill the family’s life with joy. Small Wonders is filled with colorful pages designed specifically to capture all of these wonderful moments. 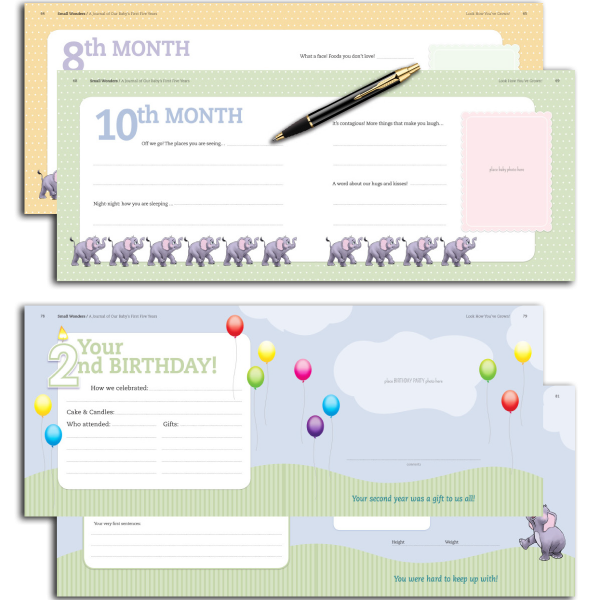 Small Wonders also provides a special section in which the family can record month-by-month milestones, plus five years of birthday details, photos, and write-in areas—including two pages dedicated to their child’s first day of school.